Note Piers Feetham Gallery is closed for Easter holiday 3 – 6 April. Much of Mirecki’s potency of image derives from the juxtaposition of man-made architecture and natural growth: a typical subject might be the River Colne in Spate. The picture’s foreground is thronged with foliage expertly painted (though thankfully not with quite the mad hallucinatory extremism of the Pre-Raphaelites), the central episode features light reflected off moving water, while trees take us into the background and the Chappel Viaduct. The accuracy is not snapshot photographic, it is a skilled recreation of a specific place at a particular time of day and season. The painting is an interpretation of a familiar landscape, an investigation into its rhythms and structures, the underlying forms which give it presence and meaning. Mirecki departs from the literal truth when it is necessary for the painting to do so, carefully heightening or moderating it. The artist’s principal work lies in making decisions about what to include and what to disregard, where to place an emphasis and where to put a counter-balance. Mirecki’s artistic transformation of his subject is so subtle and sophisticated that sometimes it goes almost unnoticed. 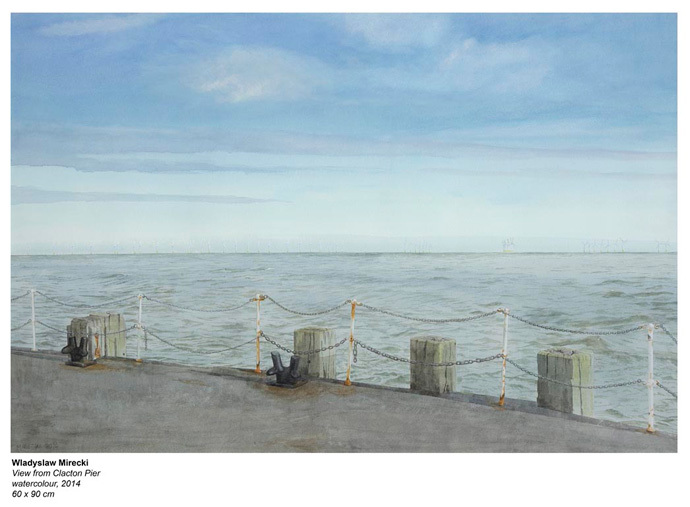 The coast has become another favoured subject, usually East Anglian, such as the beguilingly austere View from Clacton Pier, with its skeletal forms of wind turbines fading into the cloud-bank on the horizon. Occasionally there is no vestige of man’s impact on the environment. It is eye-opening to see a straightforward study of sea, sky and land, as put forward with luminous yet understated brilliance in West Cliff, Whitby II. Other landscapes include a vineyard in the south of France, and a couple of views of Salisbury. Mirecki strays in Constable’s footsteps over the water-meadows, places the cathedral’s spire at the top of his painting, but brings the focus in low, to the reed-fringed drainage system. This oddly serene image wakens echoes of John Nash’s painting The Moat, Grange Farm, Kimble (1922) in the Tate. Mirecki’s other Salisbury subject is a witty urban scene: the elegant spire caught this time between two red-brick council houses, and put in its place by satellite dish and double yellow lines. As Clive James wrote recently: ‘The only way to hide the tensions of a set form is to perfect it.’ He was referring to poetry, but the same can be said of painting: only when the conflicting tensions of a landscape are resolved, can a harmonious painting result. In these beautiful new paintings, Władysław Mirecki shows us how a vision of landscape may be perfected. 1956 Born Chelmsford, Essex of Polish parentage. He is self-taught, having painted all his life including his periods gaining his science degree, as an industrial designer and co-proprietor of Chappel Galleries (1986 - March 2010). Royal Watercolour Society Open Competition, Bankside Gallery, London. Royal Institute of Painters in Watercolours, Mall Galleries, London. Beecroft Art Gallery, Westcliffe on Sea, Essex 49th Essex Open Exhibition: Awarded Prize and Shirley Robson Bowl for the best watercolour. Chappel Galleries, Essex ‘Southwold, the East Coast’. Sunday Times/Kaupthing Singer & Friedlander, London: 3rd Prize Winner, The Mall Galleries, London. Chichester Open Art Exhibition, Chichester. Royal West of England Academy 155th Autumn Exhibition, Bristol. New English Art Club, The Mall Galleries, London. Chelmsford Borough Museum: Two Man Exhibition with Paul Rumsey, 9th February to 21st April. Studio Eleven, Westcliff on Sea, Essex: ‘Kiss the Joy’ mixed exhibition. Royal Society of British Artists, Annual Exhibition: The Mall Galleries, London. March 1st-30th ‘…just as it is…’ Chappel Galleries, Essex: Solo Exhibition. “Southwold: An Earthly Paradise” by Geoffrey Munn. Władysław Mirecki at Fifty – 32pp Monograph. ‘On My Doorstep’: Introduction by Laura Gascoigne published by Chappel Galleries, Essex. The Spectator “Winter Fine Arts” by Andrew Lambirth November issue. Jackdaw Magazine “Easel Words” May/June issue. The Artist Magazine, “Masterclass” November issue. Pratique des Arts magazine France, December issue. Duncan Campbell exhibition brochure: Introduction by Andrew Lambirth, art critic of The Spectator. 'Closely Observed' Landscape - East Anglia and Beyond: Introduction by Andrew Wilton published by Piers Feetham Gallery, London. Lynn Painter Stainers catalogue page 11 ‘Holme Valley, Yorkshire’. ‘Around and About: Introduction by David Lee editor of ‘Jackdaw’ published Chappel Galleries, Essex. ‘…just as it is…’ Introduction by Mark Curteis, Curator Chelmsford Museum, published by Chappel Galleries, Essex.